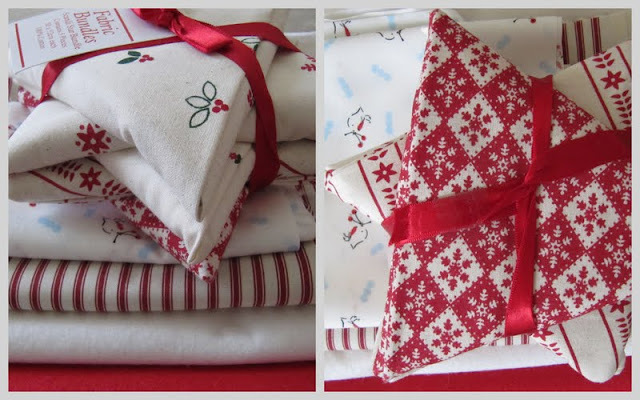 I am hopeful that the creative mojo will return because I had a moment of weakness and bought some Christmas fabric. It was folded up in the shape of a star, who could resist! Somehow, some red and white craft felt, some robins, and a grown-up stripe also made their way into my bag. Oh who can resist, they are beautiful. I'm sure they are going to inspire to create something awesome. Red and white are one of my favorite combos. Love the little robin print. You cannot fail to be inspired by those Christmassy colours and designs. Do show us what you make won't you? Lovely fabric, love that robin! Ah the old packaging trick! Actually those fabrics are so gorgeous they would look great scrunched up in an old plastic bag. Hope your mojo comes back soon Catherine! Love those little robins! What are you going to make?